The leaves are changing, the temperatures are dropping...fall has arrived, it's a sight to see. 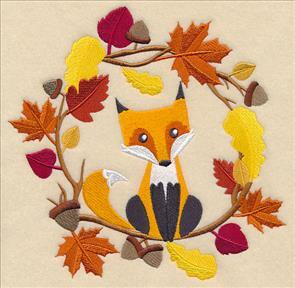 Stitch the beauty of autumn with this week's new designs! 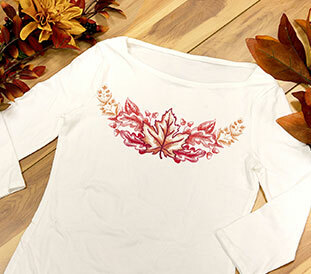 Lovely, light leaves and flower sprays are striking on long-sleeved tees and sweatshirts. 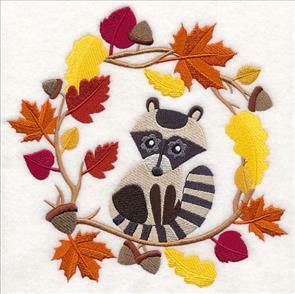 Woodland animals in wreaths add a rustic look to pillows and quilts, while trees boasting colorful leaves stun on totes and wall hangings. 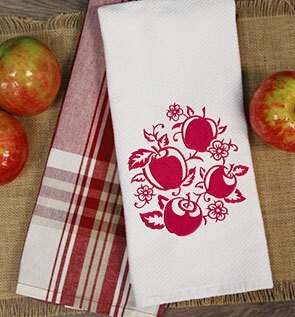 Plus, new apple designs and fall laurels are picture-perfect on tea towels and aprons. Scroll down the page to view these new designs, and order today! crafty -- look to your home! See how to make them right here. 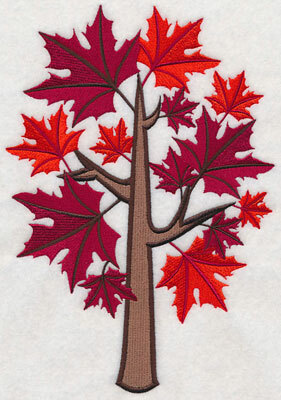 Beautiful light-stitching detail give this elegant maple leaf a lovely, whimsical appeal. Open areas show the fabric in the background, and give a toile-like effect. 10.99" x 4.35" and 9.38" x 3.71" and 7.78" x 3.08" and 6.85" x 2.71"
Add your favorite horizontal spray to a long-sleeved T-shirt or sweatshirt for an instant fall update to your wardrobe. 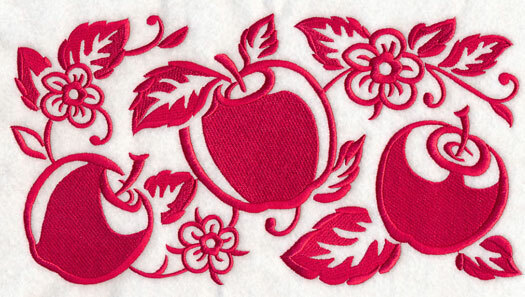 Get our best tips for embroidering on these apparel items (plus helpful videos!) in their project tutorials. You'll find information on T-shirts here and sweatshirts right here. A white oak leaf is a brilliant addition to the bottom of placemats, repeated along a table runner, or stitched on a tablecloth for fall. Find even more inspiration for setting an autumn tablescape in the Gather 'Round the Table Lookbook here. 10.99" x 4.33" and 9.38" x 3.69" and 7.79" x 3.07" and 6.85" x 2.70"
An aspen leaf finishes off this trio of stunning designs. 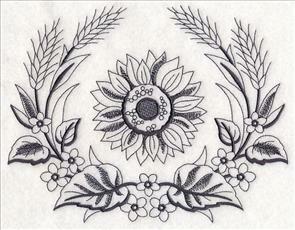 Stitch all three together, or pick your favorite to stitch alone. For best results, use on solid-color, low-nap fabrics. 10.99" x 4.29" and 9.38" x 3.66" and 7.80" x 3.05" and 6.85" x 2.68"
Fluttering multicolor moths and classic fall blooms fill this spray with the beauty of the season. 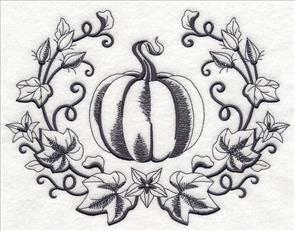 Great on T-shirts, sweatshirts, and totes, it's a stunning way to spread the spirit of autumn. 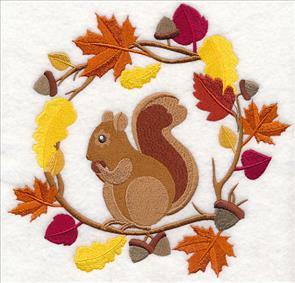 11.00" x 5.08" and 9.40" x 4.34" and 7.80" x 3.61" and 6.84" x 3.17"
A pair of prancing squirrels and woodland acorns give this spray a uniquely autumn feel. 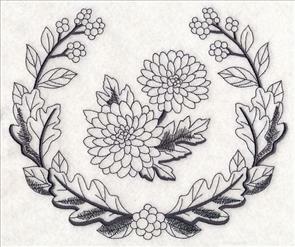 Great for stitching on placemats, or even on a garden flag! 10.99" x 4.39" and 9.38" x 3.74" and 7.78" x 3.11" and 6.85" x 2.73"
The oranges, plums, and golden brown colors found in this fall flora and fauna design mimic the look of a meadow in fall. 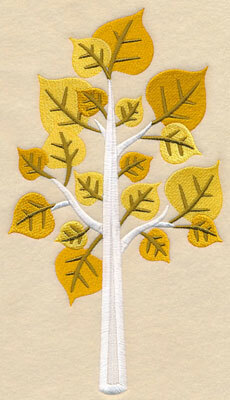 Add to a wall hanging, or embroider on a quilt. 11.00" x 4.42" and 9.40" x 3.78" and 7.80" x 3.14" and 6.85" x 2.75"
The changing colors of autumn leaves make these rustic wreaths a fabulous addition to any project. 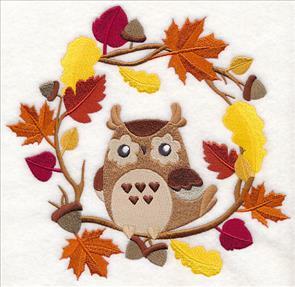 Create a quilt filled with all the forest friends, or pick your favorite for a pillow. 7.81" x 7.61" and 7.07" x 6.90"
5.99" x 5.85" and 4.98" x 4.86"
7.80" x 7.61" and 7.07" x 6.90"
Straw placemats are the perfect choice for any fall party -- add your own style with beautiful embroidery! 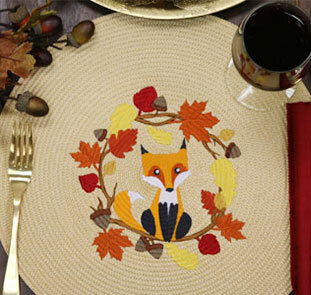 Find our best tips and tricks for embroidering on straw placemats in these project instructions, and this video tutorial. 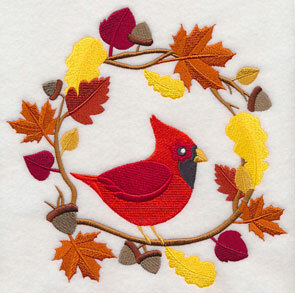 A vibrant cardinal and charming chickadee bring the sights and sounds of autumn to your embroidery. 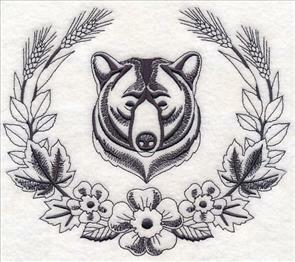 Great on a wall hanging, or embroidered on either side of a tote bag. 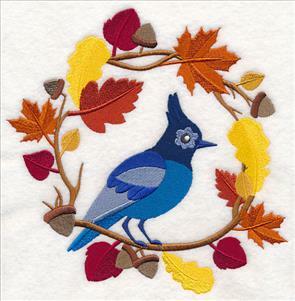 7.80" x 7.56" and 7.09" x 6.86"
6.01" x 5.82" and 4.99" x 4.83"
Embroider a blue jay or meadowlark onto the back of a denim jacket to show off your fall flair wherever you go. Or, add small sizes to dish towels or aprons. These delightful wreaths are great for home decor items, gardening gear, or even for kids' projects! Here a raccoon and a squirrel sit perched on their branches. 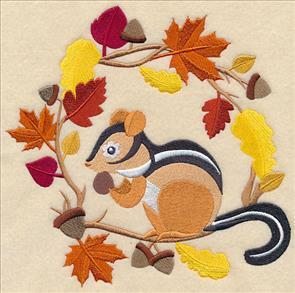 7.81" x 7.47" and 7.03" x 6.73"
6.07" x 5.81" and 5.10" x 4.88"
A sweet chipmunk is surrounded by colorful fall foliage. 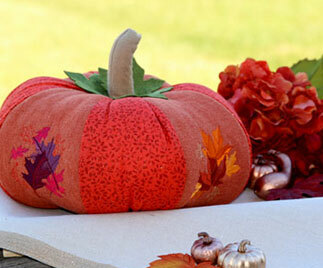 Terrific for autumn, and even Thanksgiving stitching! 7.79" x 7.71" and 6.96" x 6.89" and 5.90" x 5.84" and 4.91" x 4.87" and 3.85" x 3.83"
Bring these autumn wreaths to totes, pillows, and placemats! Purchase them individually using the links above, or get them all in a design pack. The changing of leaves marks the start of autumn's season. 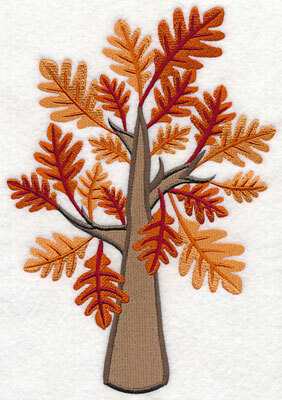 Embroider their beauty onto pillows, wall hangings, and mini-quilts with gorgeous trees like the this oak and sassafras. 6.86" x 9.81" and 5.88" x 8.40"
5.34" x 7.64" and 4.83" x 6.90"
6.86" x 9.95" and 5.72" x 8.30"
5.19" x 7.55" and 4.73" x 6.86"
The colorful leaves and whimsical style of these designs make them picture-perfect on a wide variety of projects! Try them on fall pillows, seat cushions, kitchen decor, and even framed artwork. A sweet gum tree and a yellow poplar tree turn stunning shades of red and gold when October hits. 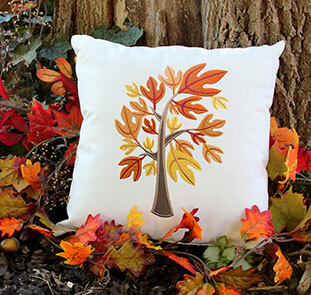 Evoke the imagery of the natural fall landscape with these designs. 6.86" x 9.81" and 5.80" x 8.30"
5.27" x 7.55" and 4.79" x 6.86"
6.63" x 9.97" and 5.52" x 8.31"
5.02" x 7.56" and 4.57" x 6.87"
A sugar maple and aspen tree are striking additions to garden flags and quilts, and are a wonderful way to usher October into your home. 6.85" x 9.75" and 5.85" x 8.36"
5.32" x 7.60" and 4.85" x 6.91"
5.63" x 9.98" and 4.69" x 8.32"
4.26" x 7.56" and 3.87" x 6.88"
Embroider these fall trees on your next project! Purchase them individually using the links above, or get them all in a design pack. Bright, juicy apples are fall's favorite fruit, and are tasty additions to your kitchen decor. 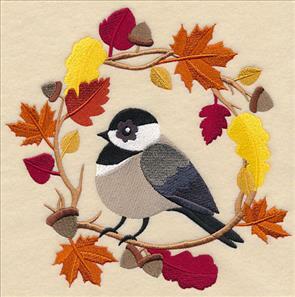 Add to aprons, wall hangings, placemats, and more! 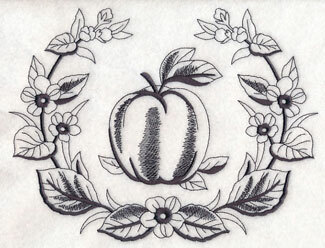 7.02" x 7.81" and 6.21" x 6.91"
5.51" x 6.13" and 4.86" x 5.40"
Add these apples to your kitchen on a waffle weave dish towel. This vibrant design makes a terrific (and tasty!) 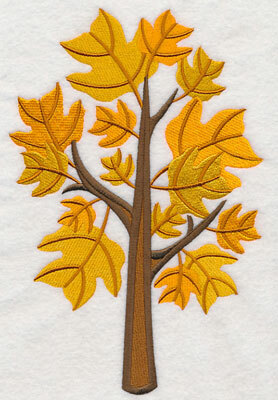 addition to table runners, quilts, and wall hangings. 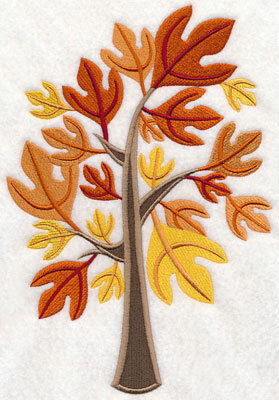 The open spaces in the designs make them ideal for stitching on sturdy fabric. 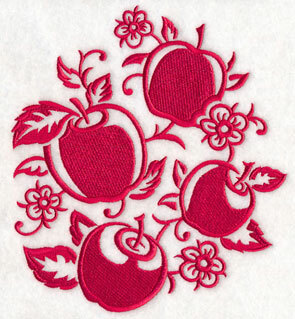 11.76" x 6.39" and 9.41" x 5.12" and 7.81" x 4.25" and 6.86" x 3.73"
Each of the apple designs are stitched with just one color thread, making them fast additions to any project. 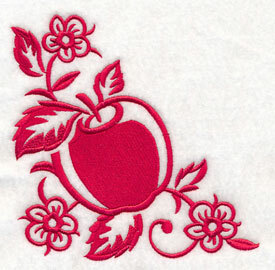 Add the quick-stitching designs to towels, table linens, pillows, and more. 11.74" x 4.03" and 9.39" x 3.23" and 7.79" x 2.68" and 6.00" x 2.29"
A delicious corner and accent design are terrific for stitching on pillow shams, napkins, pockets, and more. Get even more inspiration for stitching corner designs in this fun video. 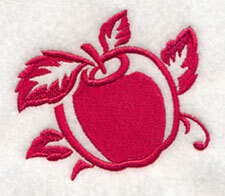 Add a tasty look to your embroidery with one-color apple designs. Pick your favorites and purchase them individually using the links above, or get them all in a design pack! Light, sketch-style laurels add subtle sophistication to a wide variety of projects. 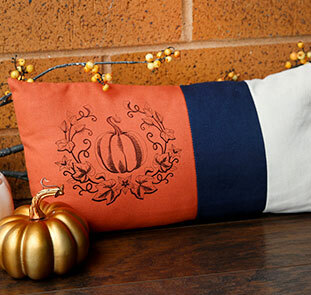 Add a fall look to pillows, tea towels, canvas tote bags, and even apparel with these one-color designs. 9.08" x 6.85" and 7.75" x 5.86"
8.63" x 6.85" and 7.80" x 6.19"
7.29" x 5.79" and 6.09" x 4.84"
Solid color fabrics are a great way to showcase these laurels, as the embroidery might get lost in a vibrant pattern. 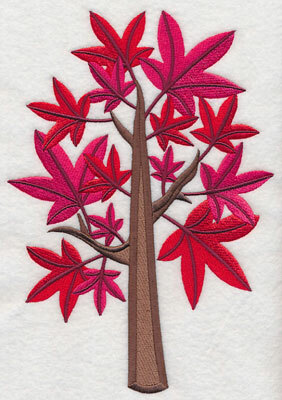 Here a multi-color pillow gets an instant embellishment with embroidery. See how to make a similar pillow here. 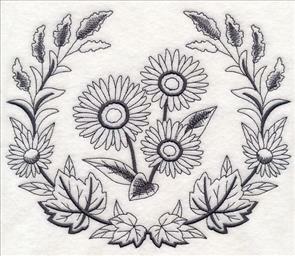 Sunflowers and asters are flowers naturally found in autumn landscapes, and their beauty is reflected in these designs. 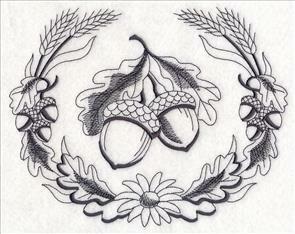 More leaves, flowers, and fall foliage can be found in their laurels. 8.73" x 6.85" and 7.80" x 6.12"
8.30" x 6.85" and 7.70" x 6.35"
7.09" x 5.85" and 5.88" x 4.86"
A burst of chrysanthemums is a gorgeous addition to totes and bags. 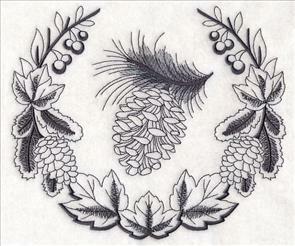 Add a pine cone design to cabin decor, fall decorations, or even winter projects! 8.27" x 6.89" and 7.51" x 6.26"
8.04" x 6.85" and 7.46" x 6.35"
6.87" x 5.85" and 5.70" x 4.86"
A majestic bear takes center stage when embroidered on fall bunting or framed artwork. 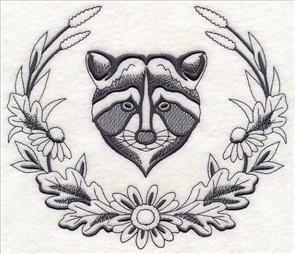 Pair with the raccoon on the right, or our other animal laurels for a cohesive look. 7.80" x 6.73" and 7.30" x 6.30"
7.80" x 6.71" and 7.31" x 6.30"
6.80" x 5.85" and 5.62" x 4.84"
A delicious apple is a great way to finish off this selection of fall laurels. 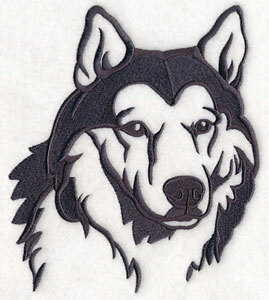 Embroider on your next project! 9.03" x 6.85" and 7.71" x 5.86" and 7.05" x 5.36" and 6.40" x 4.86"
Gloria saw the dog breed designs, and requested a version featuring huskies. 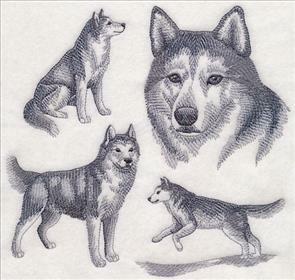 Here, a sketch and silhouette of this type of dog are ready to add to pillows, totes, and more. 6.11" x 5.85" and 5.09" x 4.84"